When the Bacon Delivery-Man had the misfortune of dumping his good near Laramie and the towns people enjoyed the gift of free bacon, I decided it was 100% necessary to look into saving bacon fat and what possibilities may be had. There were many recommendations to use the delicious fat to fry up eggs, add flavor to beans and grease various pans depending on the dish. 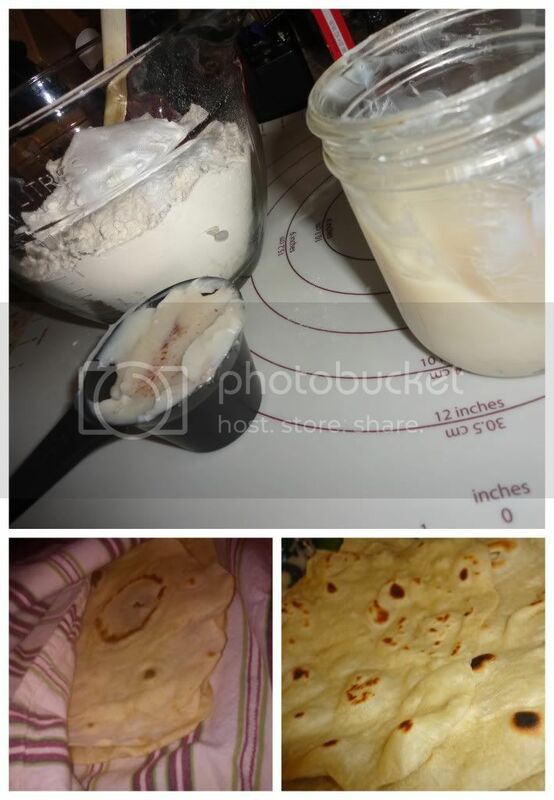 Knowing that the best tortillas are in fact made with lard, I opted to throw some of my refrigerated bacon grease into a double batch of tortillas and quite satisfied with the results! This recipe is for a single batch, although I doubled my batch with no problems. Mix together 2 cups Flour, 1 tsp. Baking Powder, 1 tsp. Salt, 1/4 cup Bacon Fat and 3/4 cups Hot Water. Knead (or mix with dough hook) until dough is smooth. Divide dough into 8 equal parts, let set for 20 minutes, covered. Roll out each dough ball into a 6-8 inch tortilla. Heat a large non-stick or cast-iron skillet over medium heat. Cook about 30 seconds on the first side, 15 seconds on second side until bubbly, browned and delicious looking! Enjoy as is or with your favorite filling.